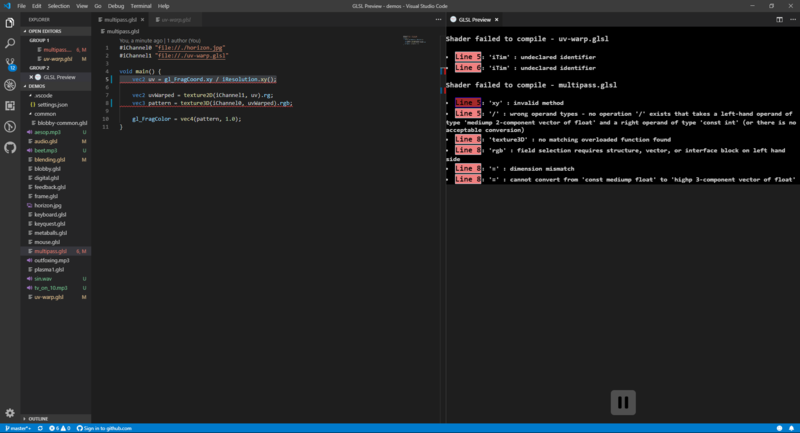 Visual Studio Code>Other>Shader ToyNew to Visual Studio Code? Get it now. With this extension, view a live WebGL preview of GLSL shaders within VSCode, similar to shadertoy.com by providing a "Show GLSL Preview" command. Running the command splits the view and displays a fullscreen quad with your shader applied. Your fragment shader's entry point is void main() or if that is unavailable void mainImage(out vec4, in vec2) where the first parameter is the output color and the second parameter is the fragments screen position. Note that for either option to be able to use relative paths you will have to open a folder in Visual Code. Note that compared to shadertoy.com gl_FragCoord replaces fragCoord and gl_FragColor replaces fragColor in the original demo. There is however a rudimentary support for inserting a trivial void main() which will delegate to a void mainImage(out vec4, in vec2) function. Additionally it will expose variables such as Key_A to Key_Z, Key_0 to Key_9, Key_UpArrow, Key_LeftArrow, Key_Shift, etc. Use these constants together with the functions mentioned above to querry the state of a key. Performance at the moment is not great for certain shaders, and the cause is under investigation. allow using audio channels like shadertoy.com does. Contributions of any kind are welcome and encouraged. Hotfix for texture loading bug introduced in the last version. fixed issue where editor changes would trigger a shader reload even if they were not text editors. Refactored a lot of code to use Visual Studio Code's WebView API instead of its deprecated PreviewHtml command. added iMouseButton uniform which holds left mousebutton in x and right mousebutton in y, 0 being up and 1 being down. added setting to enable a screenshot button to save the current frame as a png, enabled by default. Added experimental support for keyboard input. Added experimental support for includes, relative to the shader file. added an option which gives the user a pause button inside the GLSL preview. using higher precision textures if available. Hotfix for a bug which would cause users to crash on any shader preview. added shader preview command to context menu. added option to reload shaders when changing the editor. This patch adds the ability to view GLSL compiler errors. They are currently displayed as a list in the preview viewport. Adds support for texture channels. Add support for a few more of the uniforms, and implements a 1 second time delay between modifying the source and recompilation. 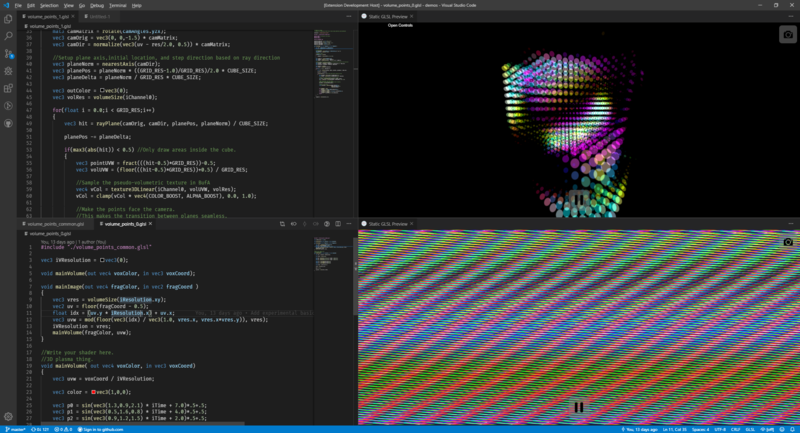 Initial release of shadertoy for vscode. Many uniforms not available. Screenshot feature's camera icon made by Smashicons from www.flaticon.com.